Our Smart Online interview today is a couple-- two interesting folks who not only have a unique website (they sell furniture! ), but a blog for it, also! We don't want to spoil the surprise...but Jane is confident you will marvel at this innovative, creative, superb interview. 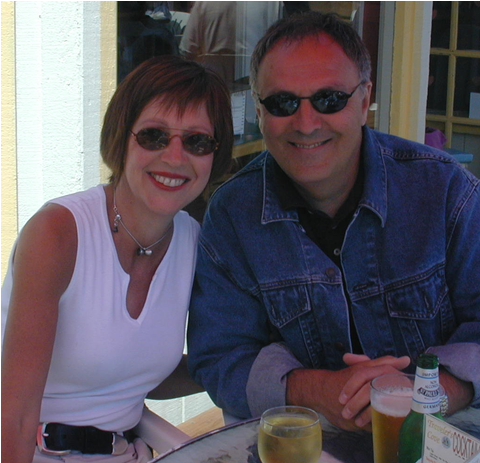 That said, we do think you should have a little background on our Smart Couple Online-- Beverly and Michael Landfair. First, we are happy to tell you that this delightful couple found Lip-sticking and wrote to us requesting a link exchange. We visited their website, and their blog, and decided an interview was in order. According to Michael, who has been Jane's contact person, he and Beverly were married in July 1992, (they're still newlyweds! awesome!). Bev comes to the furniture world from Design Resources, a "to the trade" furniture and accessory store in the Portland Design Center. Chase International, both a "to the trade" and retail store selling accessories, furniture and carpets, stole her away-- at a substantial increase in salary. When Chase decided to close, everything was moved to Macadam Floor and Furniture, including Beverly. Bev was chosen employee of the year at Macadam, in 2000, just before Macadam decided to get out of the furniture business. Mike encouraged her to start her own furniture store with an emphasis on interior design. Shortly after 9/11, Landfair Furniture + Design Gallery was opened. The store sells accessories, upholstered furniture, and case goods. To Bev and Mike's credit, the store has been profitable each year since opening! They say that about 70% of their business is "to the trade." The online store, Landfair Furniture Annex, has been open since November. Traffic to the Annex is growing, they say, but it has not yet turned a profit. Jane: The blogosphere is a unique place online-- we hope you agree! It led you to Lip-sticking and has introduced us to your unique blog. Tell our readers what led YOU -- a furniture business -- to blogging? We had a web site for the bricks and mortar (Landfair Furniture + Design Gallery), but it was used to show our furniture lines and links to special events like the Street of Dreams where we had loaned furniture. By chance, we were discussing eBay over dinner with friends and discovered none of us knew how to use eBay. I found a course being offered at a local hotel and that led to several things: We discovered that our store website was being used only for branding, so we started an online store (Landfair Furniture Annex) to sell just accessories. We thought selling on eBay would drive traffic to the online store. So we started selling sale items on eBay. We redesigned our store site to make it more helpful and added the Top Designers page to generate referrals for designers. Since most of our business is with designers, we felt this would be great for them and us. The blog Mover Mike that I originally started was "one way." Meaning, it carried ads for the two stores. It could refer to Landfair Furniture and Landfair Annex, but there were no links from those sites back to Mover Mike. Bev was afraid my views would scare off people. Since we believe that traffic drives sales, we decided to take a page from Hugh Hewitt’s book The Blog to build traffic. We asked, “How do we know that people with political views will buy furniture or accessories?” They may be mainly males and may not be our market. (readers of Hugh's book will understand...those who have not read it yet, Jane says: do it! It's well worth your time). We attempted to develop a blogroll just devoted to furniture, but were disappointed in the small numbers of blogs and their low frequency of posts. That's when we decided to start a blog (Landfair Furniture) devoted to furniture and marketing, oriented to women. It's because we realized that for many designers, getting clients is the toughest part. Many designers just don't have a marketing plan or a website-- so we felt that we could accomplish many of our goals this way. Jane: We noticed that you took the advice of one of our favorite bloggers, Toby Bloomberg, to supply readers with 10 Furniture Shopping Tips. #10 intrigues us-- "Do You need the services of an Interior designer (avoid costly mistakes.)" We wonder if you are ever called in to fix mistakes? If so, give us some examples. Beverly: Mistakes are generally wrong color, wrong style or wrong size. One of our clients was a woman who had spent $150 just on paint samples, but couldn’t make a decision. One visit by our color consultant cost her $75 and the right color the first time. She loves the color. Another woman came into our store and loved a pale green sofa on our floor. She couldn’t make a decision until we referred her to a designer who validated her selection. The designer took the risk out of the transaction. Other clients admit up front that they have made mistakes and don’t wish a repeat. On the way to our store today, Mike picked up one of those flyers attached to a post advertising a home for sale. We think furniture should conform loosely to the style of the house. The house advertised was a 1932 Colonial with craftsmen or Stickly furniture in the living room, a Country-French decorated kitchen, and a large dining room with a dining room table that belongs in a much smaller house. By using a good interior designer, the house could have had a unified theme and more appeal. A good design is efficient and pleasing to the eye. Jane: Isn't buying furniture a personal decision? With that view in mind, how can anything be a 'mistake'? Perhaps it's merely a choice. Beverly: It is a choice and it could be a poor choice. It could be the wrong color, wrong size, or wrong style. If you purchased the piece off the showroom floor, you may be able to return it. In our case, many of our client’s purchases are special order, meaning they have chosen the fabric for the sofa or chair to match colors in the home, or they have specified the finish on the wood trim or wooden table. Special orders as a rule can not be returned. We ask a lot of questions of a customer before we write up an order. Jane: Does your website get more local traffic or more national traffic? How often do you ship nationally? We're intrigued by the prospect of buying furniture online. We often ask folks what kinds of things they would never buy online and furniture seems to be a popular answer. How much do you sell via your website-- if you don't mind us asking. Michael: Everything is so new yet. LANDFAIR FURNITURE + DESIGN GALLERY has been on-line for three years; Mover Mike since since September, 2004; LANDFAIR FURNITURE ANNEX since November; and Landfair Furniture Blog since March 15th, 2005. In our case, we remodeled our lower level adding a bathroom and sheet rock over cement walls. Bev picked out the colors for the tile in the bathroom for shower and the floor. The tile wasn’t my choice. I wanted something bolder, which she insisted was too trendy. We put carpet down on the basement floor. After the basement leaked several winters, requiring the carpet to be torn up, I suggested tile! (The leak has been repaired!) The tile samples she brought home were bordering on nondescript again. While in Cabo San Lucas before Christmas, I fell in love with the terracotta floors with inch-wide grout. Bev bought the idea of the tile, but I lost on the grout, going instead with ¼ inch. Now the basement looks great again. Terracotta floor, spring green walls in part of one room and a warm candle light in the rest. She was committed to good design, as I was, but I yielded to her expertise. Jane: We really like your How-to page on your website. There is some great information there. We think you should add that link to your blog. More importantly, we wish you had more information on your blog about when and why you started your furniture store. Complete with a family photo. Have you thought of this? Is it not on the blog because the blog is so new? Michael: That is a great idea. I am finding from this conversation that there are things we can do to make all the sites better including linking to the How To page. One more thing you will see. We will be interviewing each of the Top Designers for 2004. We want to share some of their tips and philosophy with you. I have tried to emphasize the phrase Chosen By Beverly Landfair and will be posting an interview with Beverly, about her influences and fashion sense, followed by Carol Cornwell, the Top Designer for 2004. Jane: We feel a need to get practical. Do you have advice for removing stains from furniture...specifically pet stains? Jane: We would like to compliment you on the pictures of your furniture. On Jane's monitor they are clear, crisp and large enough to give us a perspective of the size of the furniture. Yet, the picture of your store is so tiny...it leaves us scratching our heads. Perhaps you might consider enlarging it...or presenting the showroom floor...or some other solution. It's a shame to highlight the products but leave us in the dark about the location. Any thoughts on that? Has that impacted your site visitor's experience, or are we just being too fussy? Michael: You know this has been a learning process. LANDFAIR FURNITURE + DESIGN GALLERY has pictures of the store inside and out and a picture of Beverly. On the Contact Us page is a map to the store and a feedback page. LANDFAIR FURNITURE ANNEX has a catalog with pictures of accessories which are professionally taken and are supplied online by our various vendors. The catalog is connected to a merchant account and items can be purchased online. Jane: We found MYMOMSBLOG on your blogroll and fell in love with it! HOW did you get her to do this? (dear readers, this is an 80 year old woman...you MUST, yes, we say MUST, visit her blog today!). You should prepare her for fame...once Lip-sticking readers see this...they will all flock to her blog. Michael: We are sorry to say MY MOMS BLOG is not related to us. We found it surfing and were struck by how great it was. I hope people will flock to her blog; you are never too old to blog! Jane: Before we sign off, tell us what kinds of things YOU both buy online...and how being online has impacted your personal shopping and your business. Beverly: Mike is the one who buys online; books, CDs, cookbooks, concert tickets, birthday presents and flowers, airline tickets, and vacation accommodations. I use the internet to scout out items, like shopping. We have sold lamps, wine racks, pottery, Coromandel trunks. Yvonne you've hit another home run. Great interview. Looking forward to reading the designer interview series. Thanks for introducing us to MyMomsBlog. Add me to "modern millie's" fan club!